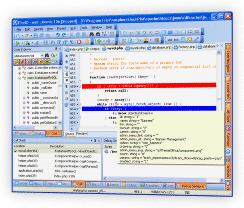 Php Debugger and PHP Profiler set apart real PHP IDE from many PHP Editors. Considered by many PHP Developers to be the most important PHP Tools, debugger and profiler are developed to the state of the Art in NuSphere's PhpED. You can use it on windows/x86, windows/64bit, freebsd 6/x86, freebsd 6/x86_64, openbsd 4/x86, openbsd 4/x86_64, netbsd 3/x86, netbsd 3/x86_64, solaris 10/x86, solaris 10/x86_64, solaris 8(and higher)/sparc, solaris 8 (and higher)/ultrasparc, freebsd 4/x86, linux 2.4/x86, linux 2.6/x86, linux 2.6/x86_64, macosx/x86, macosx/powerpc. PhpED's world famous DBG Debugger provides a powerful and easy way to simplify PHP debugging because it gives you complete visibility and control over the execution of PHP scripts and doesn't require that you make any changes to your PHP code. Getting NuSphere PHP Debugger up and running is easy with NuSphere's Settings Wizard, dbg-wziard and debugger Technical FAQ. Of course, the Debugger help is also available in PhpED's Help. How to learn which line of your PHP code is the most consuming? How to learn which part of PHP code is visited the most? NuSphere PhpED PHP Profiler has the answers. PhpED's PHP Profiler presents this information in easy to read, graphical form and puts it right at your fingertips. As we pointed out on our PhpED difference page, PhpED PHP Profiler displays the information about the performance for each line of PHP code and not just for the whole function or class method. Learn more about other PHP Tools provided by NuSphere here.